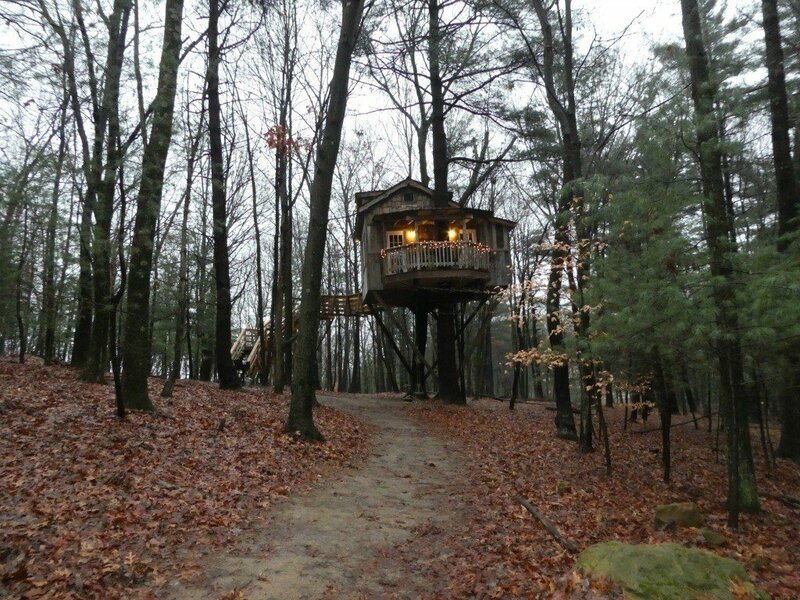 The treehouse has a TV, but no cable. No problem. 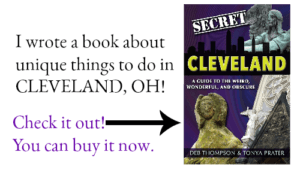 I read the tips The Mohicans provided with my reservation confirmation and planned accordingly. I was prepared with a couple DVD rentals from Redbox. 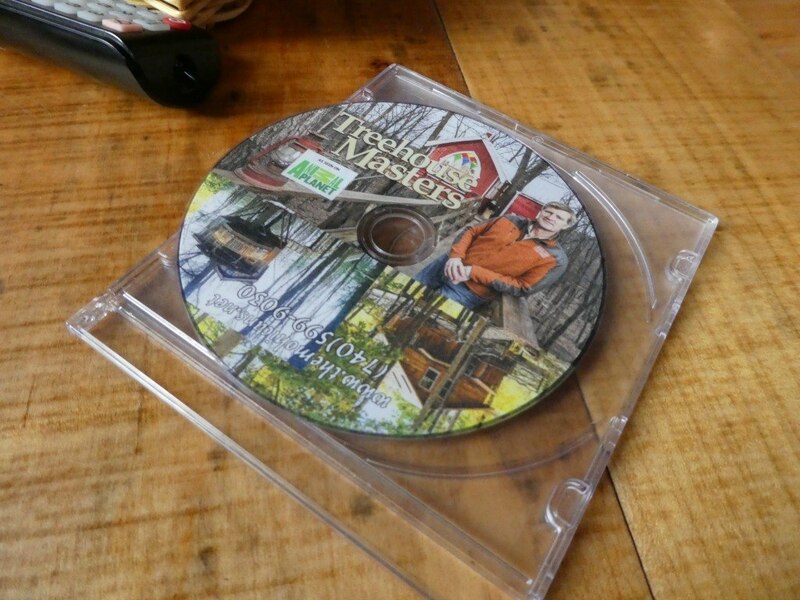 The Mohicans also provided a copy of the Treehouse Masters DVD of the episode filmed on the property. Of course, we had to watch it! The Mohicans is a good distance from a restaurant and once we arrived, we had no desire to leave. We were there to relax so I packed food for dinner. 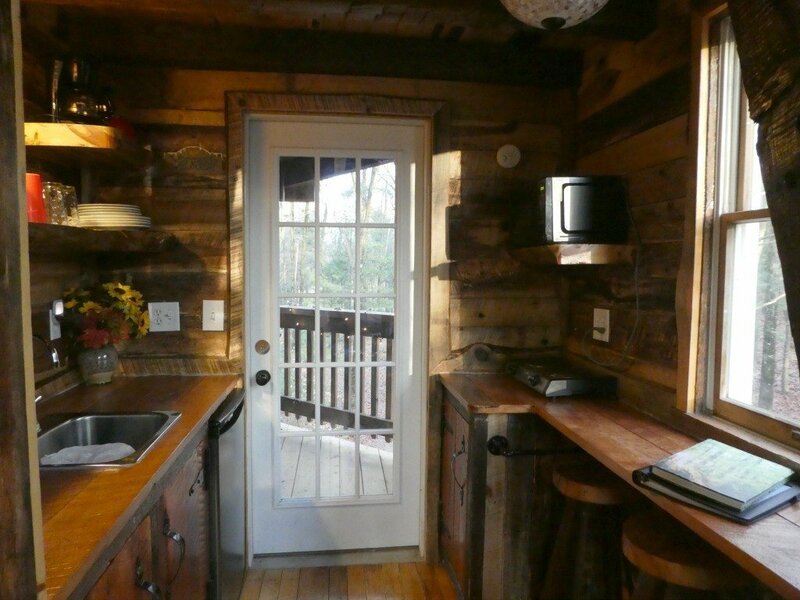 Guests can make a trip back in town (20-25 minutes), pick up carry out on the way to The Mohicans, or plan to cook in the treehouse kitchen. We chose the latter. The kitchen is well stocked for its size. 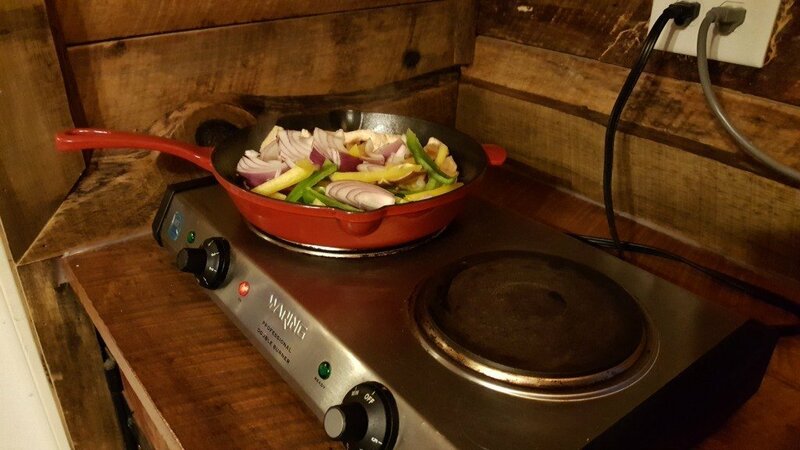 You’ll find a mini-fridge, hot plate, microwave, coffeepot, dishes, silverware, and most kitchen tools you would need for an easy meal, including the pots and pans. I was pleased to find a cutting board and knives too since I’d forgotten mine at home. While I prepared chicken fajitas with homemade guacamole, my husband began to watch Suicide Squad. How’s that for romantic? Yeah. I thought so too. Our visit happened to coincide with an unusually warm (for Ohio) January day. 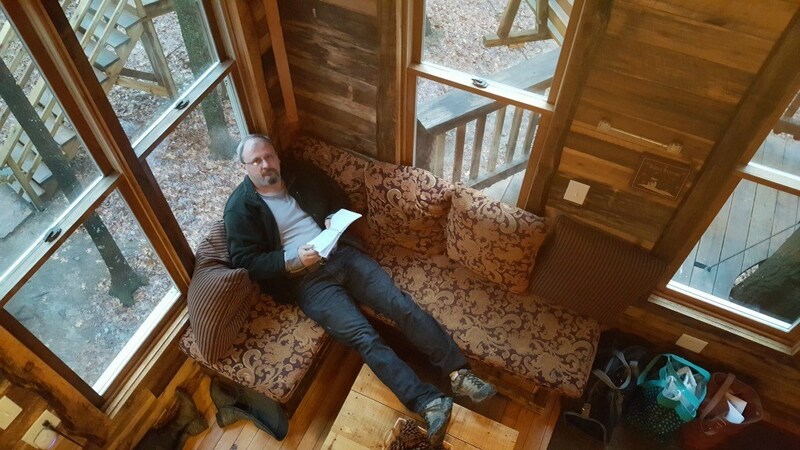 Not only were we able to enjoy the interior of the treehouse, we also enjoyed the outside. It was a bit cool, but I insisted we dine on the deck. The deck is wrapped with strands of white lights. It was peaceful and enjoyable, surrounded by the calming sounds of nature. About the time we finished eating, it started to drizzle and the wind picked up, causing the treehouse to sway ever so slightly. We finished our movie before we retired to bed to listen to the sound of the rain as it pelted the bedroom skylight. You should note that The Mohicans is kind of out in the middle of nowhere. If you live in town or are used to traffic noises, pack your white noise machine or download the app on your phone prior to your visit. The combination of the rain and the luxurious bedding did the trick for us and we were asleep in no time. The treehouse is laid out well and features a high ceiling in the living room with a loft, so while it is small, it feels very open and comfortable. The treehous also has large windows that allow plenty of natural light. Made of 100% reclaimed materials that include century-old barn siding and hand hewn beams. The heavy wood interior is softened with the use of fabric on the sectional seating area, amazing bedding (didn’t I mention that already?) on the queen size bed. There are also throw blankets to bundle up if needed. Even though it wasn’t cold during our stay, I found it comfortable to sit in the rocking chair with a throw cover while we watched our movies. I was also pleasantly surprised by the bathroom. Though it is small, I was impressed by the use of space. I fully expected to find a shower like the one we had in our RV, but instead found a large, roomy shower. 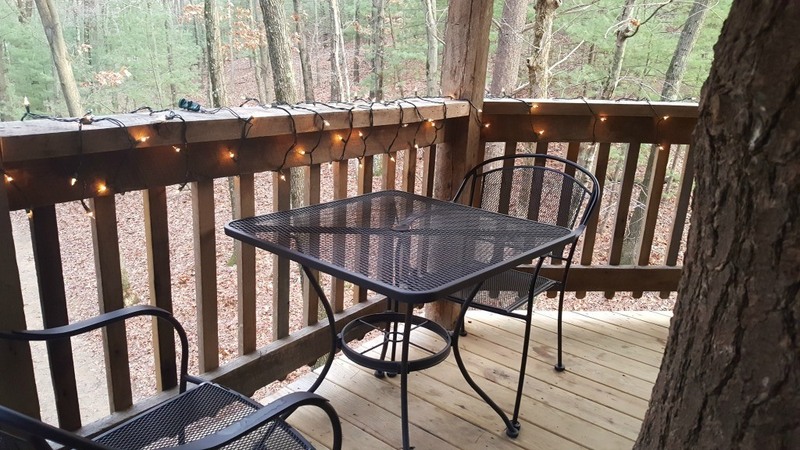 The covered deck provides added living space and a relaxing atmosphere to enjoy in warm weather. The Old Pine treehouse has a swing under the treehouse, a charcoal grill, and a fire pit on site for those days when it’s nice enough. 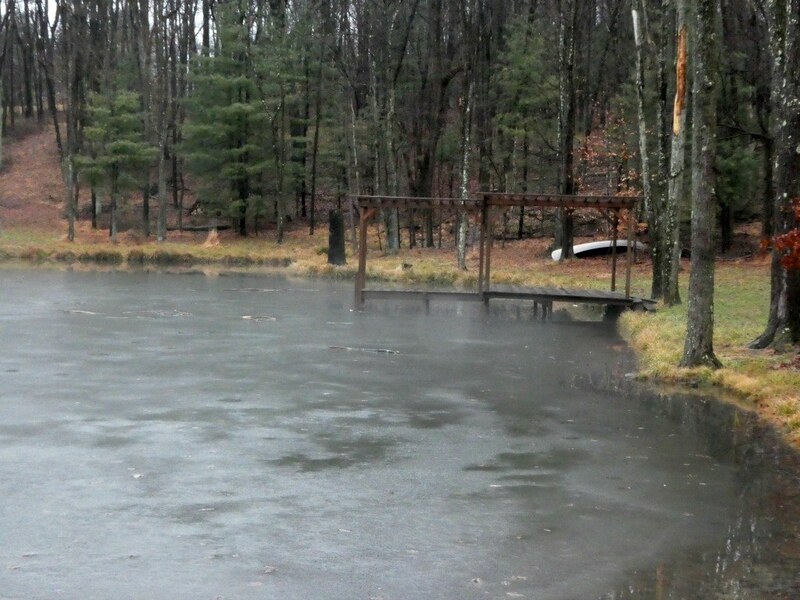 Guests are encouraged to use the pond located at the head of the trailhead leading to the treehouse. It is stocked with over 700 fish so you’re pretty much guaranteed a catch. Per the guest book, the idol has been found near both the swing and the pond. 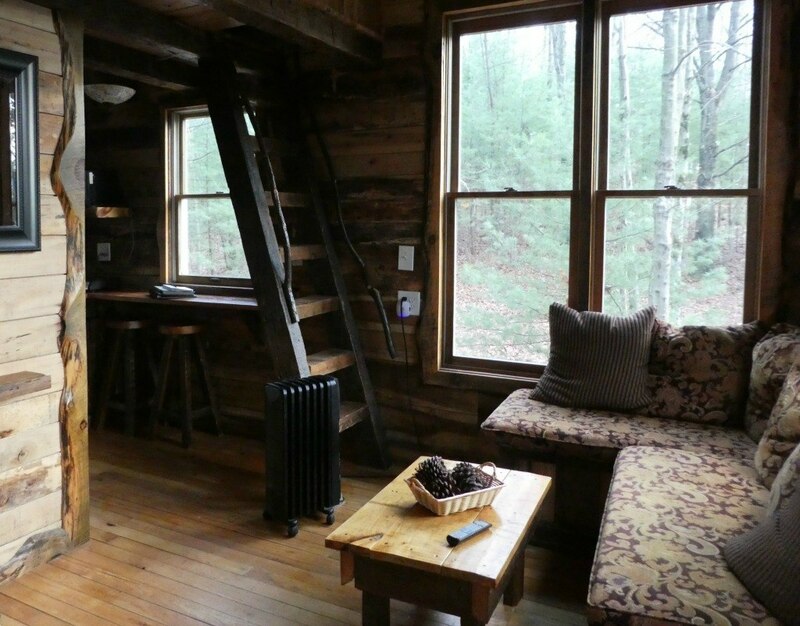 A fan of tiny houses, I mentioned several times during our stay that I could see myself living in a treehouse. My husband agreed. 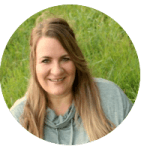 My husband and I may not have had time to stop to hike on our way to The Mohicans this time around, but a drive through the Mohican area is never a disappointment. 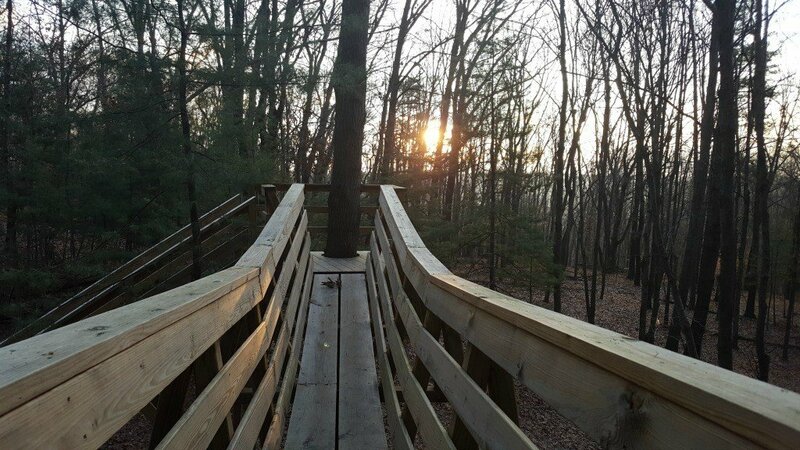 One of our favorite places to spend time outdoors in Ohio, the gently rolling hills of the Mohican-Loudonville area make for a great road trip. So our drive may have been scenic, but it was our stay at The Mohicans that exceeded our expectations. 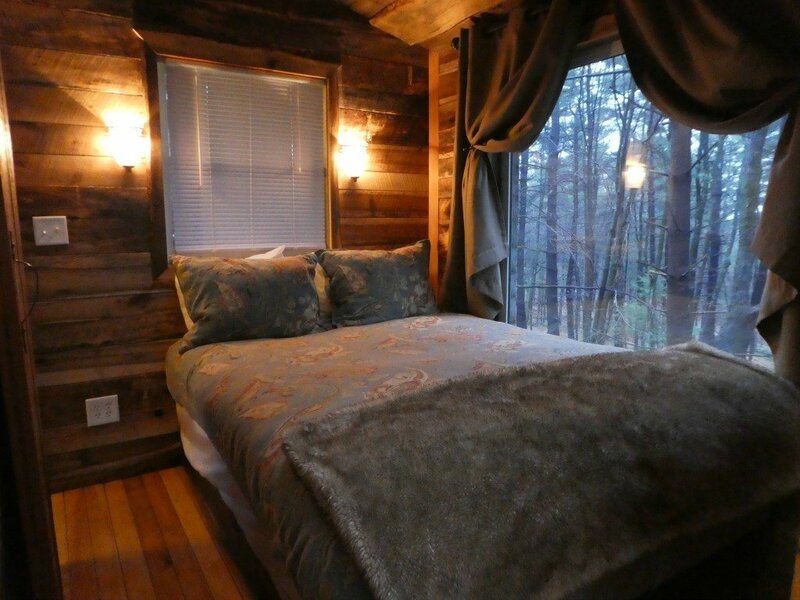 While I was enamored with the idea of slumbering in a treehouse, my husband was impressed that the Old Pine was more luxurious than he had imagined. It was a true glamping experience and one we are both eager to repeat. If you’re interested in glamping in Ohio, I wholeheartedly suggest a stay at The Mohicans. But don’t have to take my word for it. 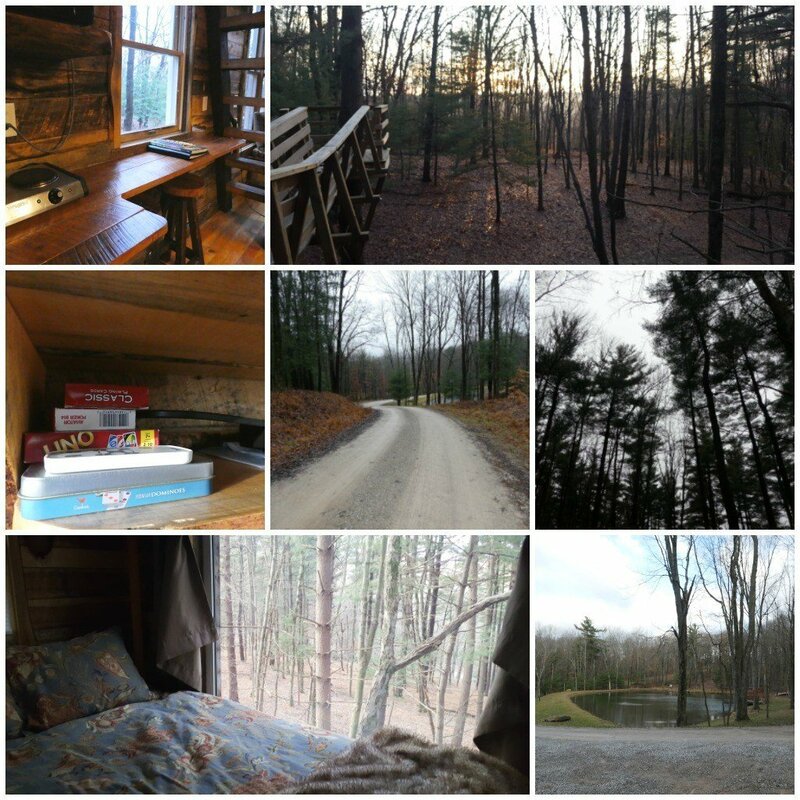 Read what other glampers had to say about their stay at The Mohicans. 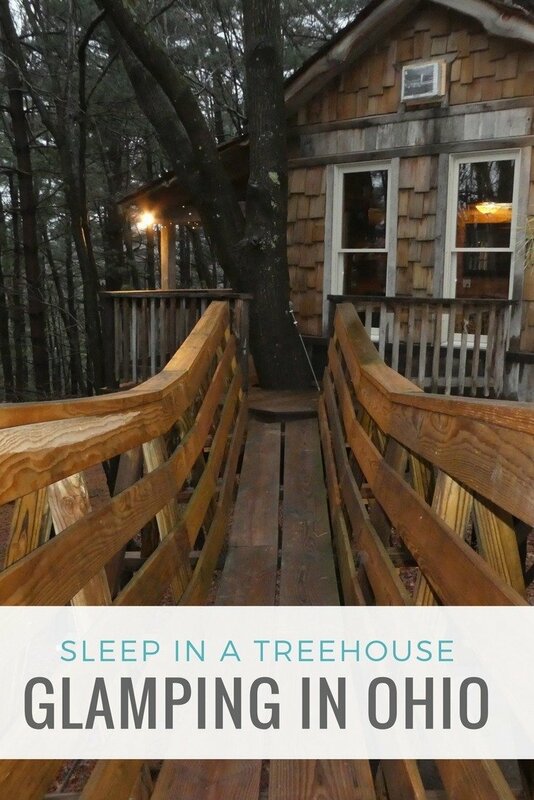 When was the last time you slept in a treehouse? Rates: Start at $250 per night, depending on season and property you select. Follow The Mohicans on social media on Facebook, Instagram, and Pinterest. Thank you to The Mohicans for hosting our stay. All opinions in this post are 100% my own.